A few days ago, I was having some guests over for dinner and its like a tradition in the house, that there should be a good variety of food, ranging from soups, salads, starters, main course and not to forget desserts. 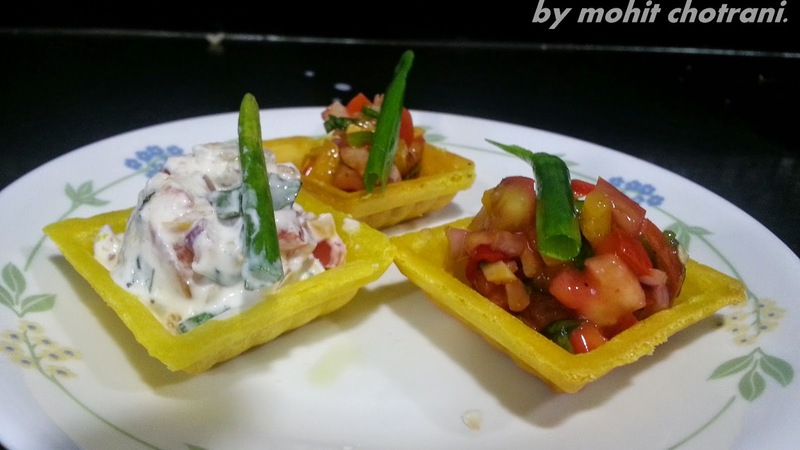 This time, I decided to make something different, a well known thing, Canapes but with different stuffings. I got home some vegetables some canape shells and removed the basic ingredients from the cupboard. 1. Fry the Canape Shells till golden brown and keep it on a kitchen towel to drain off the excess oil. 2. Cut the peppers, onion and zucchini in the small dices and keep them separate. 3. In a bowl, take the hung curd and honey and cream it will, then add in the peppers and the onions along with some salt and mix it well. 4. Once its ready, keep it in the fridge to let it extract the flavors. 5. In another bowl, take the remaining vegetables, add in the siracha sauce, tabasco and dried oregano and season it with salt and pepper. 6. Mix it well and keep in the fridge for some time. 7. While serving, take the canapes, fill the mixture and serve it at room temperature. 1. The filling can be changed and with choice. 2. Store the fried canapes in airtight containers to avoid it from getting soggy.